I introduced you to Kaylee Barfell in a previous post on LuLaRoe. Kaylee throws these Facebook parties and posts pictures of LuLaRoe pieces which we are then able to shop and buy. She has posted so many amazing outfits and pieces. When I saw this Perfect Tee, I knew I wouldn't be able to pass it up, so I made the purchase. The beauty of the Perfect Tee is in its fit. The tee is more fitted through the bodice, but then flares out from the waist. It is a tunic length, so could be worn with leggings, but also looks fantastic with skirts or jeans. For this post today, I decided to style my Perfect tee with my light orange skinny jeans that I got at dressbarn on clearance. I wanted to show you the tee with two different layering options. Since winter is on the way, I know I won't wear just a tee by itself, so I wanted to show you how you could still wear your tee, but be a bit warmer. Sorry for the fuzzy pics. I was in a hurry and it was cold. Ha, ha. 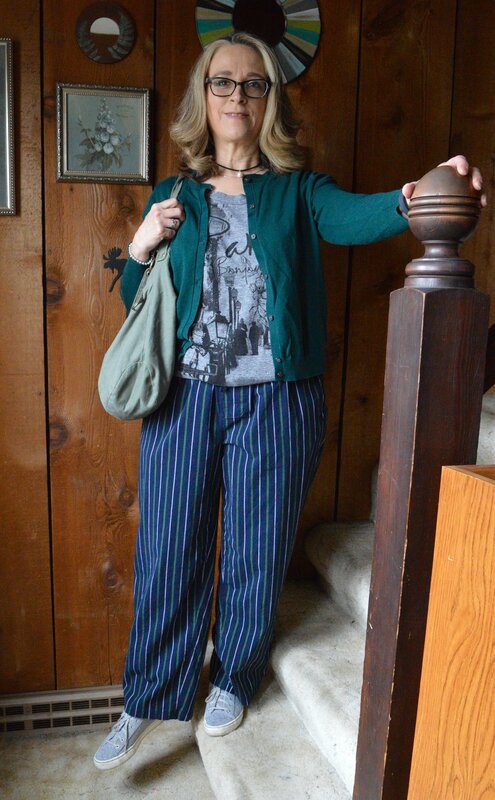 For this look, I put a blue button up blouse under the Perfect Tee. For size reference in the Perfect I went with a medium, because it flares out at the bottom. Many times I buy a large in a top, not because I need it through the bust, but because I don't want all my bulges to show. With the Perfect Tee you don't have to worry about that. It fits just right in the bust area and I was able to get this blouse on underneath without bulges and wrinkles. Here is a close up of the pattern. LuLaRoe has so many fun and colorful patterns. That is part of the draw. To keep the look simple I chose yellow beads for my necklace and bracelets, my blue SO flats and a gray clutch. I had to add a twirl, so you could see how the Perfect is more like a swing tee. For the second look I took the button up off and put my denim crop jacket over the top. I swapped out the yellow beads for a long green and gold fringe pendant necklace. I decided to wear my suede ankle boots and opted for a large yellow tote. What do you think? Do you like to dress in layers? Have you ever layered a blouse under a tee? Layering is a great way to extend the wearability of some of your summer clothing into the fall and your fall clothing into the winter. I hope you enjoyed this post. Have a great weekend. It is hard to believe that it is May already, especially since the weather has been so cold and rainy. When I looked at the forecast for the next few days, at least the temps are supposed to get up into the sixties. Whoo, hoo. It's a heat wave! Today we are looking at a pretty blue color that the Pantone color gurus labeled Niagara. For this outfit, I decided to stick with the denim theme since the blue truly is denim-like. I chose my lighter blue chambray shirt from Christopher and Banks. (Similar here.) I then topped that with my denim vest from Christopher and Banks. (Similar here. This one has some embroidery instead of rhinestones, which is very trendy right now.) For pants I pulled out my plaid Gloria Vanderbilt crop pants. What drew me to this vest was the bling. I'm a bling sort of girl. Can we ever be too old for bling? Never! For a bag I chose my Niagara colored clutch. It goes perfectly with the denim and the texturing adds a different interest to the outfit. Since the pants have some brown in them, I went for brown accessories, both my ankle boots and my jewelry, to tie the look together. Niagara is a color everyone can wear. It's not too dark and not too light. It can be accessorized in many different ways and comes in a variety of pieces from tops and vests, to pants and dresses. What do you think of this medium blue color? I would love to hear your thoughts in the comments section below. Or leave me a comment on my Facebook page or on Instagram. I've included some shopping options below. Because these are affiliate links, I get a few cents when you click on a link. If you purchase an item through my site, I get a little commission. All opinions expressed are my own. I appreciate all of your support. Please tell your friends about my blog and ask them to subscribe too. Your subscriptions help me to grow as well. Be sure to check back Thursday for a look another Awesome Accessory! Have a great day. Monday linking up with Catherine of Not Dressed as Lamb. Tuesday linking up with Jess of Elegantly Dressed and Stylish. Wednesday linking up with Sara and Hannah of The Perfect Storm. 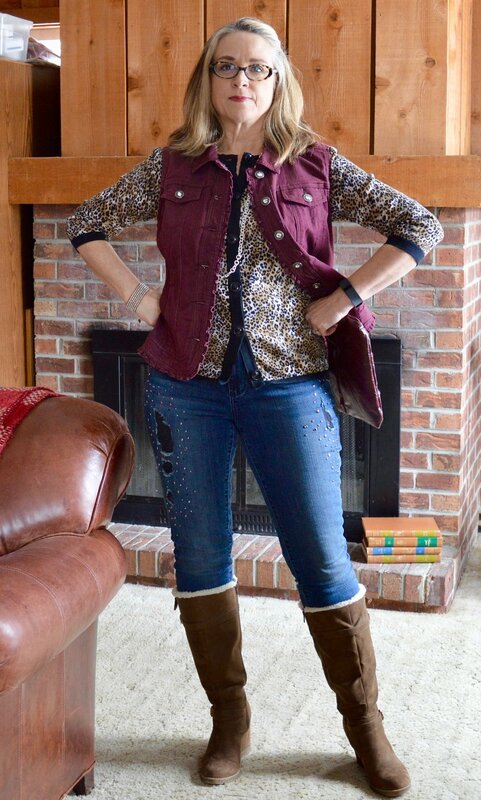 Friday linking up with Nancy of Nancy's Fashion Style, and Jennie of A Pocketful of Polka Dots. If you follow the Pantone colors, you know that they come up with a palette every spring and fall that contains ten colors. This palette becomes the basis for what fashion designers and architectural designers use as their color schemes for clothing, accessories, paint colors and home goods, such as furniture, bedding and pillows. Today's earthy hue is called Flame. This bold, deep orange is evocative of sunny days sipping iced tea and warm evenings sitting around a campfire toasting marshmallows. It also shouts of day lilies and fuzzy peaches warmed by the mid day sun. Earlier in the year, Liz of With Wonder and Whimsy and I, did a collaboration sneak peek of the Spring Pantone colors. To see my post click here. For one of my outfits I styled the same pair of pants that I used in last week's post and called it Flame. Just for fun I want you to see the difference in these two oranges. When we initially did our sneak peek back in February, I thought these orange pants were pretty close to the actual Pantone color. Turns out I was wrong! See, I do mess up! Ha, ha. It's all good. I am still learning about color. Perhaps that is the reason I enjoy doing this series on the Pantone colors. The first orange really is more of a pumpkin color and has yellow undertones. Flame has more red undertones. So we could say, orange is orange is orange, but in reality, it isn't. The reason, I am spending a bit of time on this idea of color, is that I often hear people say, "I can't wear that color. It just washes me out." In reality, I think we can wear every color out there. You just have to know which version of the color is flattering for you. I probably would not wear the pumpkin orange near my face, but Flame, I can. However, I can wear the pumpkin orange as pants and it is no problem. On to my outfit. This Flame utility jacket I purchased at Nordstrom Rack with the gift cards I received from winning a drawing on Jodie's Touch of Style. I fell in love not only with the style, but with the color. I wore my dark wash skinny jeans, although I think any wash denim would look good with this orange. This orange would also look great with brown, khaki, olive and white. I rolled the jeans for a fun look and the lighter colored cuff adds some interesting texture. Since stripes are in I decided to wear my navy and white Loft tee. I found this at a thrift store. It is a nice weight and has an elastic bottom. I love that it is a tee, but hides my flaws. The best kind! You can also see I kept the jewelry simple. Gold seemed to be a nice contrast, but I think silver would have worked as well. My navy blue bag, another thrift store find, is a Vera Wang. I love the dual tone and texturing on the bag, and, of course, the roominess. This was meant to be a transitional outfit, taking me from winter to spring. In Northwest Ohio, for me it is still pants weather, so I will be wearing this again. I went with a pair of ankle boots, but it could be just as cute with a pair of fun canvas sneakers or cute flip flops. What do you think of this orange? Do you think you like the pumpkin orange of my pants or this Flame color better? Let me know your thoughts in the comments section below. I hope you are enjoying this series on the Pantone Spring 2017 colors. I love to read your comments. Right now if you make a comment you won't know if I respond, but I always respond to your input. Just check back on the original post a day or so later and you will be able to see that. I am so thankful for your support. This post contains affiliate links, which means I get a small trickle of income if you click on a shopping link. If you buy something through my post I get a small commission. That means a lot to me. All opinions expressed are my own. Here are some possible "orange" options. Monday linking up with Catherine of Not Dressed as Lamb. 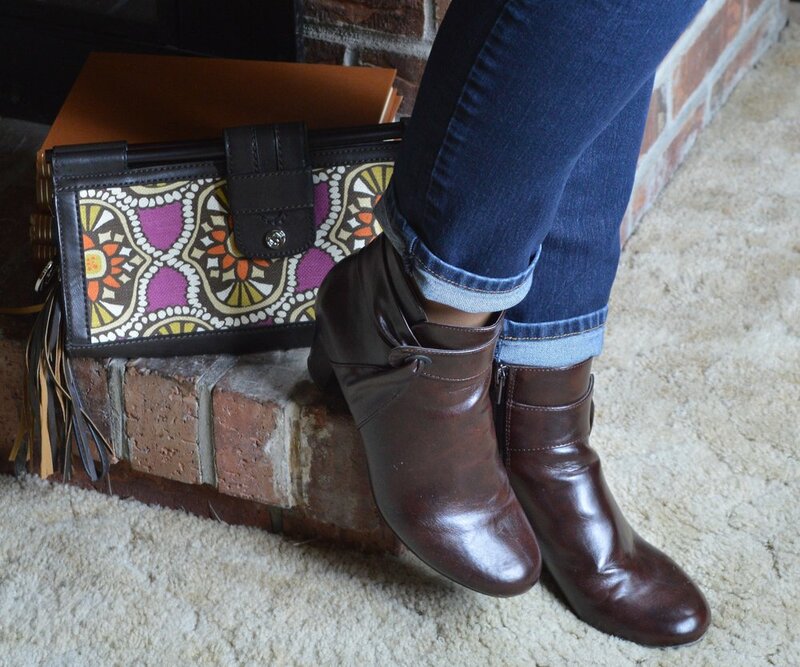 Tuesday linking up with Nicki of Sweet Parrish Place, Jess of Elegantly Dressed and Stylish. Wednesday linking up with Sara and Hannah of The Perfect Storm. 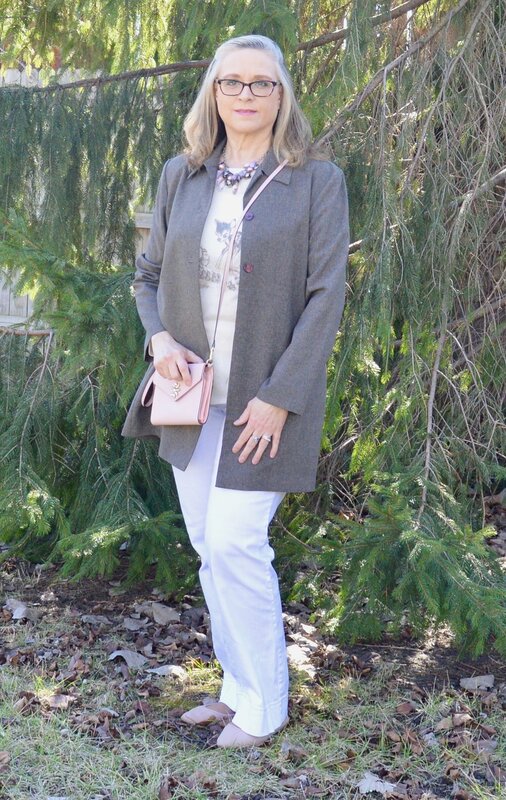 Friday linking up with JoLynne Shane in the Fashion Friday link up and Nancy of Nancy's Fashion Style. It seems almost silly to start a series on the Spring 2017 Pantone colors, as the Fall colors are already on their website. However, I have never been one to stick to the rules of fashion, once I discovered exactly what fashion is. Ha, ha. So for all of you who work on a "better late than never" mentality, this one is for you. I am starting my series on the Pantone Spring 2017 colors. These are being brought to you in the order they appear here on the Pantone website. The first color in this report for spring is the color they labeled, Primrose Yellow. Similar shirt at Jacket Society - here. When I saw this top and scarf on sale on The Jacket Society website, I knew I had to add them to my collection. We are seeing so many combinations of florals and stripes together and I think Nora was a bit ahead of the trend when she first posted this top on her site a while back. I love this combination of gray, yellow, black and white. 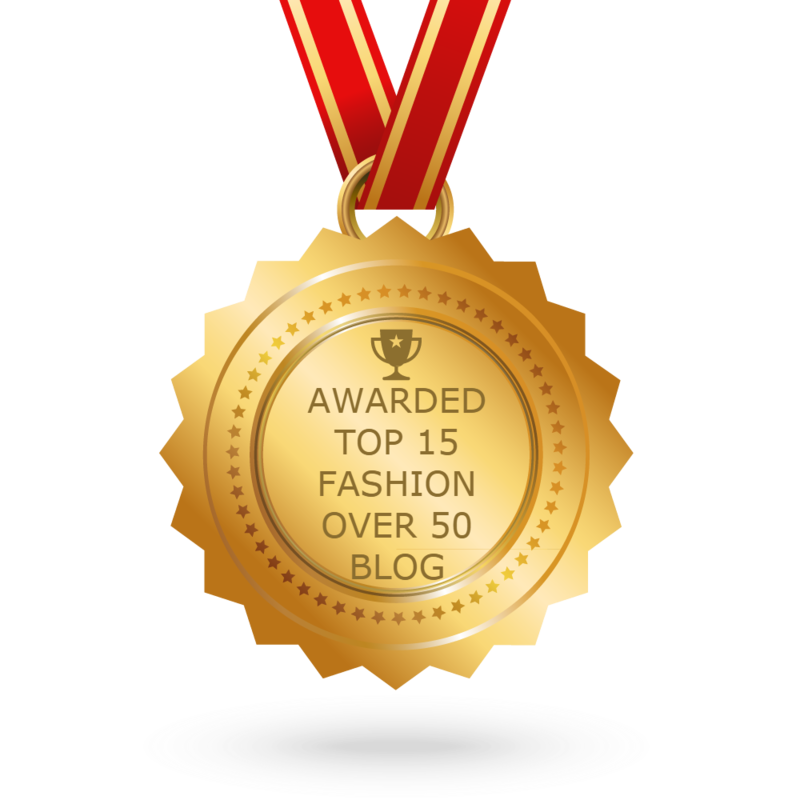 I paired the top with my gray skinny jeans, yellow jewelry and pewter hobo bag. This baseball type top has an asymmetrical hem line being shorter at the sides and longer in the front and back. I tucked the front in and left the back out. I also wore my gray suede ankle boots to give the outfit added texture. I used to think I couldn't wear yellow, but I think this bright, cheery color is a lovely addition to any wardrobe, even if you only get a few statement pieces of jewelry. It will bring a bit of sunshine to your outfit. I hope you enjoyed this post on Primrose Yellow. Do you like this yellow? Would you wear this color or do you steer clear of yellows of any kind? I'd love to hear your thoughts! This post contains affiliate links. If you click on a shopping link I get a few cents. If you purchase something through my post I get a little commission. Thanks for the support. All opinions expressed in this post are my own. 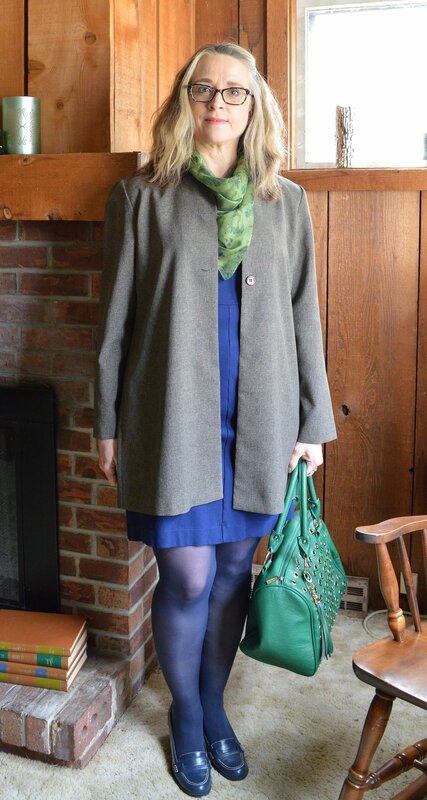 Monday linking up with Catherine of Not Dressed as Lamb. Tuesday linking up with Shelbee of in the Spread the Kindness Link Up. 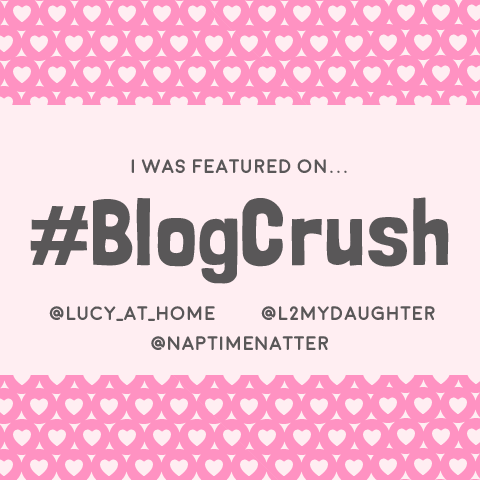 Wednesday linking up with Sara and Hannah of The Perfect Storm. Friday linking up with Jo-Lynne Shane in the Fashion Friday link up.